The 1970 Stanley Cup Final NHL championship series was contested by the Boston Bruins and the St. Louis Blues, appearing in their third straight finals. The Bruins were making their first appearance in the Final since the 1958 Final. The Bruins would win the series 4–0, their first Stanley Cup victory in 29 years. Bobby Orr scored the Cup-winning goal on Glenn Hall, with an assist from Derek Sanderson, at forty seconds of overtime, and the subsequent image of Orr flying through the air, his arms raised in victory — he had been tripped by Blues' defenceman Noel Picard at the moment of shooting — is arguably the most famous and recognized hockey image of all time. Boston defeated the New York Rangers 4–2 and the Chicago Black Hawks 4–0 to advance to the final. St. Louis defeated the Minnesota North Stars 4–2 and the Pittsburgh Penguins 4–2. At 3:57 of the first period, a hard shot from Fred Stanfield was deflected and struck Jacques Plante in the forehead of his face mask, splitting the mask in half and injuring Plante. Plante was finished for the series. Doctors later said if he hadn't been wearing the mask, he surely would have been killed. Ernie Wakely took over in goal but only held off the Bruins for a few minutes before becoming a rather easy mark for Bruins sharpshooters. Complete with the first defenseman to score 100 points in an NHL season, the Boston Bruins readied themselves for a match-up against the three-time finalist St. Louis Blues. Bobby Orr was that defenseman, and he ended up scoring the cup-winning goal. 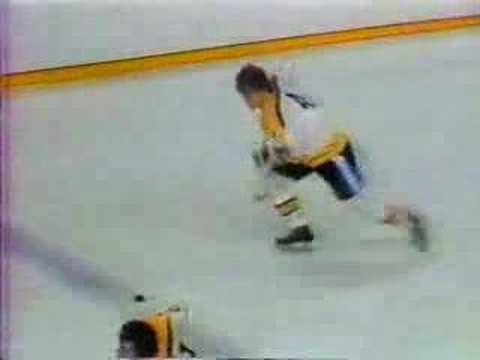 Orr scored the winner in overtime, who, after scoring was tripped up by Blues' Noel Picard and literally flew through the air. 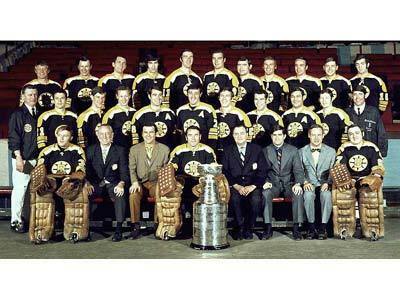 The Bruins ended a 29-year Cup drought, dating back to 1941. Orr capped his finest season winning the Conn Smythe and Norris trophies. In the playoffs, Boston opened up against the New York Rangers, who finished in 4th place in the Eastern Division, with 92 points, 7 less than the Bruins. The series opened up at the Boston Garden, and the Bruins continued their winning ways at home, taking the first 2 games to take an early series lead. The series then moved to Madison Square Garden in New York for the next 2 games, and the Rangers responded with 2 close wins, and tied the series up at 2 games each. Boston returned home for game 5, and took a 3–2 series lead with a hard fought 3–2 win in the game, and the Bruins would finish off the Rangers in game 6 on the road, beating New York 4–1, and advance to the Eastern Division finals. The Bruins opponent for the division finals was the Chicago Black Hawks, who finished with 99 points, the same as Boston, but had more wins, so they were awarded home ice for the series. Boston would surprise the Chicago fans by taking the first 2 games held at Chicago Stadium with relative ease to take a 2–0 series lead. Boston then took game 3 by a 5–2 score at the Boston Garden, and took a commanding 3–0 lead in the series. The Black Hawks would keep game 4 close, but would lose, as Boston won the game 5–4, and swept Chicago, to advance to the Stanley Cup finals for the first time since 1958. Boston would face the winner of the Western Division, the St. Louis Blues, who were making their 3rd straight Stanley Cup final appearance. The Blues had previously been swept by the Montreal Canadiens in their first 2 times in the finals. St. Louis had defeated the Minnesota North Stars and Pittsburgh Penguins to earn a spot. The series would open at the St. Louis Arena, and the Bruins had no problems at all in their first 2 games, defeating the Blues by scores of 6–1 and 6–2, and took a 2–0 series lead. The series shifted to Boston for the next 2 games, and the Bruins again dominated game 3, winning 4–1. St. Louis would force the 4th game into overtime; however the Bruins, on a goal by Bobby Orr, would win the game 4–3, winning an NHL record 10th straight playoff game, and win their first cup since 1941, and the 4th in franchise history. The still photo of Orr flying through the air after scoring the goal became one of the most iconic images of the Bruins franchise in its history.